CONTIXO KIDS TABLETS with WiFi, camera, apps and more are great for kids of all ages (recommended age 2+ to 12 years of age). It comes with parental-control software, supports multiple user profiles, free tablet protection case to prevent minor bumps and scratches and more. Our Contixo kids tablet has Bluetooth wireless feature and is compatible with other Bluetooth devices such as headphones, keyboards, speakers, and more. Connect a speaker, headphones, headset, keyboard, etc. wirelessly via Bluetooth connection. Front and rear cameras allow kids to take photos and capture their special moments. Ensures that children are protected when using the kids tablet. There’s no need to worry about unfriendly content on the Internet. Kids can get access to fun educational, and learning games, videos and websites which you choose for them. FREE GAMES & APPS – 13 top learning & educational apps and entertainment games are pre-loaded. Additional fun games & educational apps are available for downloading in Google Play Store. PARENTAL CONTROL & CHILD LOCK – Protect children from inappropriate content and unauthorized purchases. Parents can choose appropriate apps & games for kids. The child-friendly interface makes it simple for children, kids to use. POWERFUL, FULL-FEATURED TABLET + BLUETOOTH WIRELESS FEATURE -Connect via Bluetooth with the Contixo Bluetooth keyboard & Contixo Kids Bluetooth Headphones. Equipped with latest Quad-Core Processor, 8GB Storage & 1GB RAM, Android 6.0 Operating System, 7″ Touch Screen Display (1024×600 resolution), front and rear (dual) cameras. 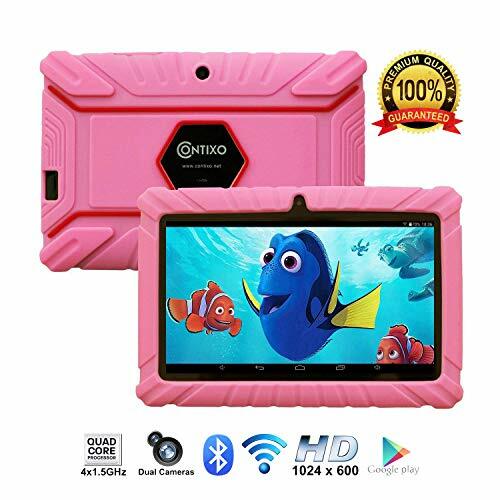 DURABLE PROTECTIVE CASE & SCREEN PROTECTOR – The kids tablet case is made of high-quality soft rubber silicone, specially designed to protect the device from drops, bumps. 3-layer film LCD screen protector protects the screen from any accidental damages. US-BASED CUSTOMER SERVICE & TECHNICAL SUPPORT – Providing outstanding customer service is our NO.1 priority. Should you ever run into any problems or need assistance, we are here to help, 100% satisfaction guarantee!